Peter Bakker is a Dutch-born linguist who is active in a number of different linguistic fields, chief among which pidgins and creoles, mixed languages and contact-induced language change. He has also published extensively on Romani linguistics. He is the author/editor of numerous books, which include A Language of Our Own: The Genesis of Michif, the Mixed Cree-French Language of the Canadian Métis (1992), Bibliography of Modern Romani Linguistics (1997, with Yaron Matras), The Typology and Dialectology of Romani (1997, co-edited with Yaron Matras and Hristo Kyuchukov), and Contact Languages: A Comprehensive Guide (2013, co-edited with Yaron Matras; paperback 2016). Some of his other interests include genderlects, language genesis and the relation between culture and linguistic structure. We interviewed him in Aarhus about his work in linguistics. Could you briefly summarise what it is you do in linguistics? As for my field, I would call it ‘new languages’ – how they emerge, either through contact with other languages or through a lack of contact, and I try to link the structures of such languages with the way they come about. I started out studying creoles languages by chance I should say – I was studying in Amsterdam and all the courses were always amazing and interesting, but that semester there was nothing interesting on offer. So I took a course in creole linguistics which turned out to be awesome, and I got quite hooked on the subject. The following semesters we had world-famous guest teachers at the time; Derek Bickerton, Mervyn Alleyne, Glenn Gilbert, it was fantastic. My MA thesis was about twins who make their own language, in the light of Bickerton’s theory about children as creators of creole languages. I then did fieldwork on Michif and wrote my dissertation on it. 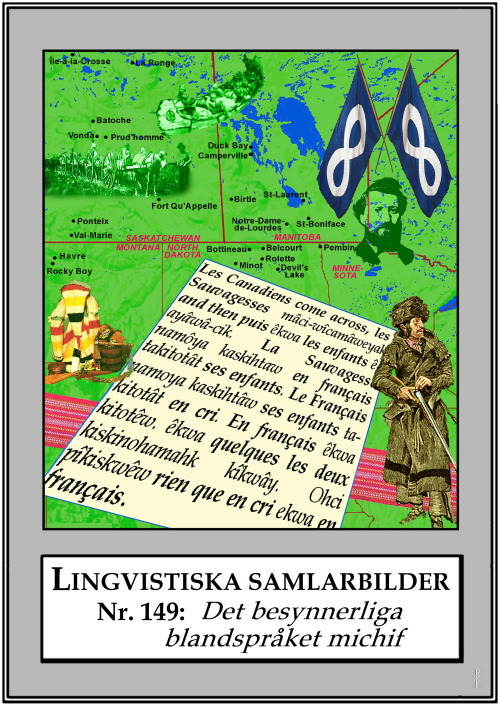 Michif is a so-called mixed language, which emerged out of bilingualism in French and Cree. In Michif all the verbs are from Cree and the nouns are from French, and it also has two separate sound systems, one for words of French origin and one for words from Cree origin. Despite the initial enthusiasm, I lost interest in creoles at some point, but recently it came back and we are just finishing a three-year project here in Aarhus called Cognitive Creolistics, where we try to combine cognitive linguistics with creole linguistics. But we look at all sorts of aspects of creoles, such as how they differ from non-creoles, and what historical and social processes give rise to creoles. Do pidgins and creoles just have a kind of attraction to you, or is there also an element of theory in there? Because the way they come about also has strong theoretical implications of course. For instance, some people might say that pdigins develop into creoles so quickly because the children that learned it as a first language have a complex, innate language faculty in their brain. Others have very different views on that, and there are creolists who say that creoles are still a lot simpler than most natural languages. Indeed, and of course pidgins as well as creoles are interesting in that regard. Pidgins are interesting because there you can see how little is actually needed to communicate. Many obligatory elements that occur in most languages are absent in pidgins, such as noun gender, verb tense, and so on. And that’s the interesting thing about them; how far can you strip down a language and still communicate adequately? Creoles are interesting because they are in fact full-fledged languages, but they suddenly emerged out of very reduced input, a pidgin. All of a sudden you find tense marking, plural marking, and other grammatical elements. And many of these grammatical distinctions are newly formed, not inherited from the languages from which they inherited the vocabulary. I find that quite fascinating; what categories do the children that learn it as a first language develop, and why? But there’s also a limit to what kind of developments you see in those languages. For instance, some languages have obligatory prefixes or suffixes that indicate how you got the information you utter in the sentence, called evidential markers. But in a creole you would never find such a thing. Or the noun gender we find in languages like Danish, German and Dutch, no creole ever has that. That’s why our project was called Cognitive Creolistics, because we were interested in what sort of phenomena arise. So what kind of elements so speakers need that are lacking in a pidgin? These languages arise in a vacuum, there is nobody who teaches it to them or tells them how it ought to be spoken. It’s a bottom-up kind of development in a sense – spontaneous language planning, without any agencies. 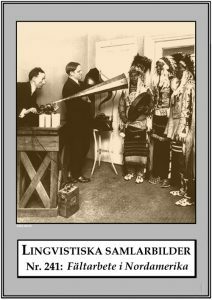 Picture: From Mikael Parkvall’s collection Lingvististiska samlarbilder. Used with Mikael’s permission. So you could say that in a sense pidgins are the minimum needed for basic communication, whereas creoles comprise the minimum needed for first language acquirers. Yes, that’s a good way of characterising it. And of course there are also influences from the original languages of these pidgin speakers, such as African influences on the pidgins and creoles of the Caribbean, like Surinamese creoles or Haitian. You can clearly see traces of African languages there. But there is much more in a creole that is created bottom-up, without influence from other languages. So there are a lot of ‘default’ traits that creoles have in common. Yes. One of the things we did in Cognitive Creolistics is take a lot of traits from many different languages, creoles and non-creoles, converted these traits to numeric values and entered these into a computer program used for what we call phylogenetics – basically, this is a program that was originally used to calculate the evolutionary history of organisms by comparing DNA-sequences, but you can also use it to analyse languages. This program then groups languages according to things they have in common, similar to shared DNA in organisms. The result was that, almost without exception, you see that creoles are grouped together with other creoles, against non-creoles, so they really are structurally alike. And that is largely independent from where in the world they emerge and which languages are spoken by the creators of creoles. 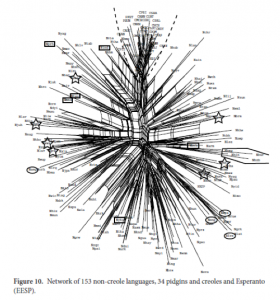 Picture: Network of 153 non-creole languages, 34 pidgins and creoles and Esperanto. Phylogenetic network of pidgins, creoles and non-creole languages. Source. Interestingly, sometimes you also find European languages amongst the creoles, and currently I’m trying to find out why that is. You know, in Europe people originally spoke smaller languages like Celtic or Iberian, and only later did we see massive shifts to larger languages like Latin or one of the Germanic languages, from which modern languages like Spanish, English and French developed. It could well be that as a result of such growth we see traces of a kind of creolisation in effect even in European languages. To what extent does what most people consider to be the holy grail of linguistics, namely the way language develops in our brain, matter to you in light of pidgins and creoles? Only in a very superficial way. I have many colleagues around me in semiotics and linguistics who do all kinds of measurements, experiments and brain scans, but I simply didn’t grow up with that. If I were a young student now, I would certainly be interested in that kind of research. On the other hand, I realise it’s very basic what people are doing there. Often people will look for areas that light up in the brain and draw conclusions about it, but you don’t know exactly what is happening there. We don’t know much about how the brain works of course. Yes, but we’re learning more and more about it of course. In the sixteenth century people didn’t know all our blood vessels were connected, and then someone discovered that. Right now we are at that stage with the brain, we really don’t know much about what’s going on there. Your work covers many different topics, but I noticed that much of it deals with minority peoples. Is this something that connects all your interests, or is there more to it? Well, it’s also endangered languages in combination with language change I’m concerned with. Many of these smaller languages tend to change faster than others, and it’s interesting to see what happens through contact with larger languages. That’s why I’m also very interested in Romani, for example; we can assume that it was one language at some point in time, but now it’s spoken in so many different areas with so many languages that dominate it. If you look at these different Romani dialects you can learn so much about language contact and change. So my work deals with these two perspectives; endangered languages, and the rate of change and contact influences you see reflected in languages – so no, it’s not all about minorities. Then again, I did decide at one point that I would never do anything with bigger languages. There are so many people working on English, for instance, but given the fact that every two weeks or so another language dies, I’d rather work on smaller languages rather than work out, for example, the behaviour of the past tense marker in 18th-century English. If we want to study language as a whole in all its complexities, we need to have a broad view of diversity, so now is really the time to focus on smaller languages. I also think I noticed an element of ‘educating the masses’ in some of your work. For instance, showing there’s no such thing as linguistic inferiority, and that all people are equal. Yes, well that’s a good observation. I believe in the fundamental equality of all people, and I think that’s a re-occurring message in my work. If not directly, then in any case implicitly. When people ask me why linguistics is important, that’s usually difficult to answer. Like all other scientists, we are mainly just curious but ideally we can show people why it’s important. Linguistics is important, but we don’t come up with fancy devices to show for it. What I often say is that we owe to linguistics the idea that there’s no such thing as an inferior language, similar to biologists finding out that homosexuality is just a genetic trait and not a curse, choice or disease. Exactly. It’s quite important to get this sort of knowledge across, albeit indirectly. Each language is incredibly complex, and languages are so incredibly different from one another. This diversity alone forces you to accept the fundamental equality of humans. You don’t have to tell that directly. Admittedly, sometimes when teaching I sneak in a message in a different way. For instance, when I teach something about statistics I include a graph that shows a correlation between meat consumption and cancer (laughter). So there is definitely an element of moral in there, yes. Last question. What does linguistics need in your view? We need people who go out into the field and describe languages. We also need more data-oriented approaches to linguistics, and we need to take data seriously, not mold or select it to fit a certain theory. So theory must be based on data, and data must be taken seriously. It’s a bit outdated now, but at some point you had a certain linguistic rule called the right-hand head rule for noun compounds. This rule was claimed to be universal among all languages. And when a language diverged from that rule, they would say that it is in fact a right-headed language, and they would come up with all sorts of transformations to make it fit the English pattern, and that’s completely ridiculous. In that sense English is what Latin used to be during the Renaissance and later on, where people would describe other languages based on Latin; they described the case system, for instance, even if the language didn’t actually have any case. And now English is the model, at least for some linguists, and I think that’s completely wrong. 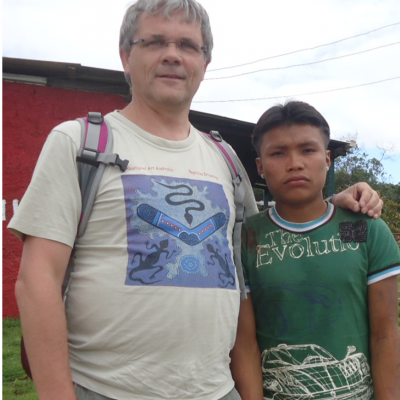 Jeroen is a PhD student in Linguistics at Aarhus University. He conducted this interview for his previous linguistics blog fuzzygrammar.wordpress.com in 2016.